How Far Along? 20 weeks, halfway there sweetpea! Size of Baby: A small cantaloupe (6.5 inches). That seems large -- a lot larger than the heirloom tomato last week. Weight Gain: Up two pounds this week, so +4 from my normal pre-pregnancy weight, +7 from my lowest pregnancy weight. Maternity Clothes: I stopped at Goodwill to look for a tacky Christmas sweater and ended up spotting a maternity rack -- no shame in my game! I found a hardly-worn pair of Pea In The Pod khaki bootcut pants for $3.99! And they have a full tummy panel which is so comfy on me. They are in the wash now and they will be perfect for the work travel I have coming up in January and February. When you see how much stores charge for maternity pants, you know how much of a steal this is -- most Pea In The Pod pants are $85 and up. Movement: Baby girl moves around quite a bit, especially when I eat something sweet or change positions from standing up to sitting down. It's so dang sweet. Love this feeling. Symptoms: Besides this growing belly, not many symptoms to report upon. No wonder people love the second trimester! Sleep: Sleeping really well and loving my Snoogle pregnancy pillow. Cravings: I still love sweets. Ordered Belgian waffles with bananas and walnuts for breakfast Saturday morning when we were in DC and they were the jam. Not exactly "normal" April, though. I typically would have gone for an omelet! Best Moment This Week: Talking about baby girl with Ian's grandparents! They are so excited and happy. I can't wait for them to meet her. I love these updates :) Good find on those $4 pants! Ha! I keep a list too and I'm not even married or expecting yet :) I have about 15 girls names and 4 boys names...hopefully baby #1 will be a girl for me! I am so ready for Baby R to have a name!!!! I can't wait to find out what you end up picking! And also, i agree on how outrageous maternity clothes cost. Ergh! Great finds! Oh how I adore you...! I am an omelet girl too. AND I definitely have a running list of baby names under Notes in my phone!!!! I am glad you keep the running list in your phone too.. you never know when you will hear a good one! I swear it sugar carbs were the best when I was pregnant with SS. My husband referred to her as baby pancake for a long time, and I usually prefer cheese to sugar. Good score on the pants! Total steal! You look amazing - seriously! Can't wait to see which name you decide upon - I can only imagine the pressure! I can't believe you are 20 weeks already! You're glowing!!! Can't belive you're already 1/2 through your pregnancy! Can't wait to hear baby girls name!!! It sounds like everything is going so well! It's so special that you were able to share in the excitement with Ian's grandparents. I can only imagine how happy your families must be! great good-will find! maternity pants are ridiculously priced...but growing mommas have to have them! And names are so tough...such a big responsibility! 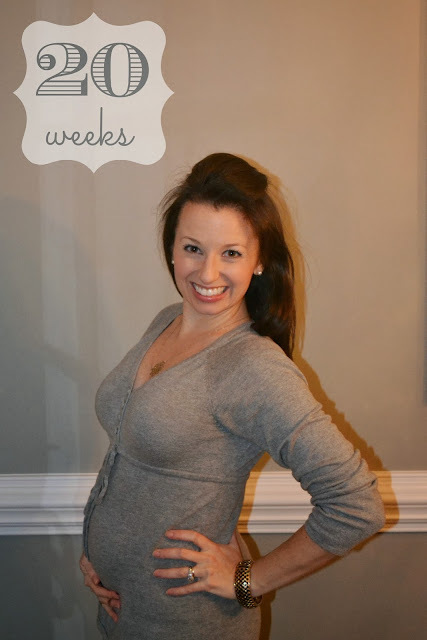 I am so glad the second trimester is not being difficult on you! You look wonderful as always and yay for cheapie pants! Picking a name is SO hard!! I always thought I'd know (I had a list too!) but as soon as I peed on that stick, all my ideas went out the window. I did not want to commit to something without meeting her first. that is STEAL on your maternity pants! shoot, i'd go back to that goodwill and check the maternity section often! Girl, you look fabulous, especially that hair! Tutorial please? And $4 pants? Rock on! !